The incidents occurred January 6, according to a senior U.S. military official. 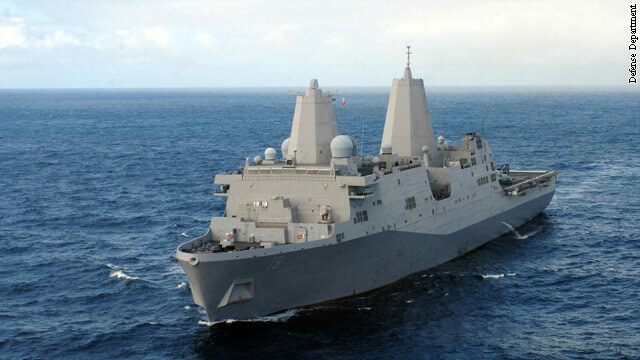 The USS New Orleans, an amphibious transport ship was sailing through the Strait of Hormuz into the Persian Gulf last Friday when three Iranian Navy speed boats rapidly approached within 500 yards of the ship, the official said. The Iranians did not respond to whistle signals or voice queries from the New Orleans. The lack of response disregards standard maritime protocols, the official said. The boats eventually broke away. On the same day, the U.S. Coast Guard cutter Adak was also harassed by high-speed Iranian Navy boats while operating 75 miles east of Kuwait City. Iranian personnel in the small boats appeared to be holding AK-47 rifles and at least one video camera, the official said. U.S. personnel on the cutter also reported seeing a forward gun that was manned on one of the Iranian boats, according to the official. Eventually, communications with a larger Iranian vessel in the area were established and the speed boats stopped their harassment. No shots were fired in either incident, both of which were videotaped. The Pentagon may release that footage later Friday. While the U.S. Navy has had routine encounters with Iranian naval forces for years, the Navy has reported seeing more aggressive action in recent weeks from Iranian-flagged vessels. Officials believe such aggressive action carries the potential for miscalculation. Typically, Iranian small boats are operated by forces of the Iranian Revolutionary Guard Corps force and are considered to be more aggressive than regular Iranian forces. Word of the aggressive encounters by Iran comes as the United States has conducted two recent rescues of Iranian mariners at sea at a time of rising tensions in the region. Iran has threatened to close the Strait of Hormuz, the only outlet from the Persian Gulf, as it faces increased scrutiny over its nuclear program. The critical shipping lane had 17 million barrels of oil per day passing through in 2011, according to the U.S. Energy Information Agency. Iran threatened to block the strait if sanctions are imposed on its oil exports. France, Britain and Germany have proposed sanctions to punish Iran's lack of cooperation on its nuclear program. Hey very cool blog!! Guy .. Excellent .. Wonderful .. I'll bookmark your website and take the feeds additionally?I am satisfied to search out numerous useful information here in the put up, we want work out extra strategies on this regard, thanks for sharing. . . . . .
Its like you learn my mind! You seem to grasp so much about this, such as you wrote the e book in it or something. I think that you just can do with a few percent to pressure the message home a bit, but other than that, this is wonderful blog. A fantastic read. I will definitely be back. Hello There. I discovered your weblog the use of msn. This is an extremely neatly written article. I will be sure to bookmark it and return to read more of your helpful information. Thanks for the post. I'll certainly comeback.